There is not much that can top the excitement and adrenaline that comes with riding a motorcycle out on the open road. Unfortunately, accidents still happen, and the truth is you are at a much greater risk of suffering from serious injuries or death than any other driver of a car, truck, SUV, or minivan. Motorcyclists share highways and roads all across the U.S. Motorcycles are legal motor vehicles, and as such, people who ride them have the same rights as people who drive cars. Even so, motorcycles tend to fall prey to drunk drivers and inattentive drivers far more than their car-driving counterparts. According to recent statistics by the National Highway Traffic Safety Administration (NHTSA), a motorcyclist is approximately 16 times more likely to die in a crash than an automobile occupant. What’s more, they are three times more likely to be injured than people who ride in cars. For those who were involved in fatal motorcycle crashes, head injury was the leading cause of death. In addition, NHTSA estimates that wearing a helmet while riding a motorcycle reduces the chances of a fatality by 29 percent. Surprisingly, not all states require motorcyclists to wear helmets. Fortunately, Alabama law strictly requires that all motorcyclists wear helmets. Of course, if you get into an accident, wearing a helmet will only protect your head. It will not prevent you from injuring another portion of your body to keep your bike from sustaining serious damage. The other driver is distracted by possibly their smartphone, texting, others in the vehicle, their thoughts, and more. Failure to obey road signs, traffic signals and speed limits. Not being able to see around you due to intersections, buildings, parked vehicles or shrubbery, among other things. Road hazards such as potholes, oil slicks, puddles, debris and uneven pavement. Motorcyclists being difficult to see and going undetected by other drivers. Truck drivers are at even more risk of not seeing a motorcyclist. Drivers of these huge vehicles often have blind spots and do not see the comparatively small motorcycle, which can result in a collision. Motorcycle defects related to fuel system leaks, which present an increased risk of fire in the post-crash phase. Inclement weather such as heavy rain, snow, hail, etc. can lead to decreased visibility and hazardous driving conditions. If you are the victim of a motorcycle accident, you want to seek medical attention immediately, even if you don’t feel injured. Be sure to file a police report and get the insurance information of the other driver right away. It is very important that everything is on record and while you remember as many details as possible. If you can and are able, take photos of the scene and collect any evidence, it will greatly help your case. Usually, the other party’s insurance company will try to negotiate a settlement with you. Insurance companies tend to low-ball your offer. You will want a personal injury attorney that will fight for you to get the compensation you deserve. Our goal for you is to ensure you receive the best medical treatment available so you make the best medical recovery possible, and to obtain the maximum monetary compensation for your physical, financial and emotional losses. 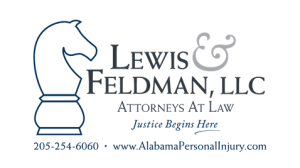 If you or a loved one has been injured or killed in a motorcycle accident, please schedule a free initial consultation and case evaluation by calling the law office of Lewis & Feldman, LLC locally at 205-254-6060, toll-free at 888-295-7409 or complete our contact form. You can also email us at jon@LewisAndFeldman.com and dfeldman@LewisAndFeldman.com. We’re the motorcycle accident lawyers serving Birmingham, Bessemer, Hoover and the state of Alabama who can help you receive the justice you deserve.